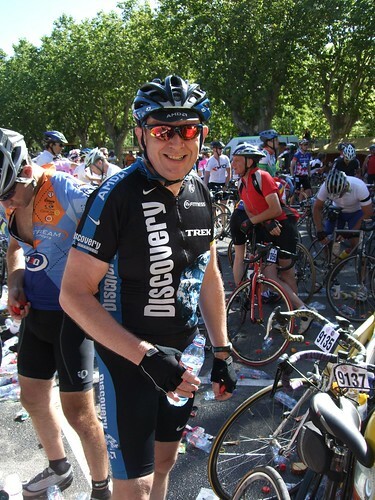 Once you’ve got your Etape entry and managed to get to the event, the first thing you have to do is register the day or two before. For me this involved a 27 mile ride to the start village to sort out any teething problems before the big day. It did start out as a group ride but split and split again as there are some big hitters and the pace was high. I’d dropped off the front group and took to the Edge which was programmed with the Start Village. 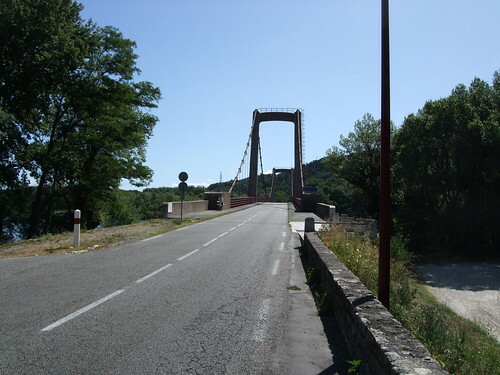 took a picture of this bridge across the Rhone as it looked Ok coming up to it rather than some of the more bland crossings. The plan was to find the bike store overnight then sign in. I arrived at the registration, signed in then had to find the bike store. As it was the overnight bikestore was cancelled as there were hundreds of bikes there and not the 30 exclusive ones that the brochure would have you believe. 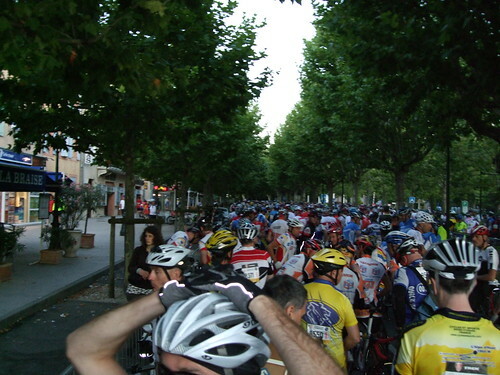 It turned out for the best as if there were any traffic problems you could be stuck 10 km from the start with no bike. So the bikes went back in the trailer, assembled. The Start Village was good but you’d better have deep pockets these days as even an SIS Gel was 2 Euro. Plenty of carbon wheels to drool over and you do come away with the impression that it is not a sport for those on a budget and people will pay what it takes to ensure a success. People just couldn’t help themselves, they had to touch Lances bike. It was back to the bus after this after I bumped into Dean coming in to register. The goody bag is a nice Trek rucksack this year. 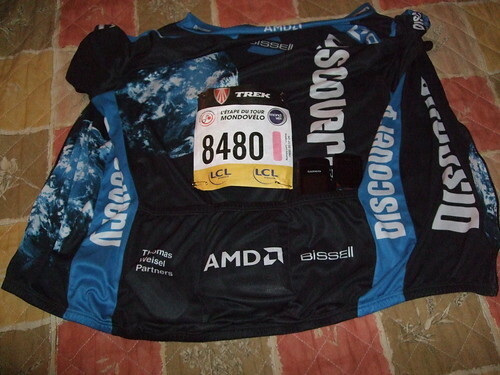 This is the jersey fully loaded with everything I’m going to ride with the night before after a tip from one of the group. It was a good tip as there were no worries about anything in the morning. 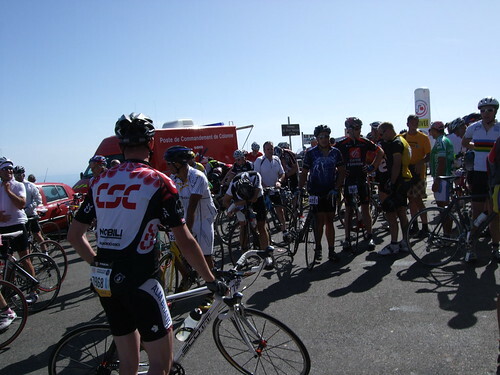 It was a 4 am Breakfast with the coach leaving at about 4:50, what noticable was the volume of traffic and as the event got closer, people riding in from a few km’s away. There was a lot of them too, all trying to reach the right pen. I know you are supposed to get there early to get at the front but in real life it doesn’t happen. This is what it looks like to be at the back of the field of 9500, bottom right is the “The Doc” who has joine d the Northend. I knew we were in the same pen but to find him in front of me was a surprise. The “Doc ” has invested in a hydration pack and we will have to compare notes about how it went as I blew up along with a lot of others on the climb from Bedoin. The chap in the Bianchi shirt is Craig who is also on the trip. It’s a nervous wait in SAS 8 waiting to move, the first group went off at 7:00 but nothing seems to happen for an age. There is nothing you can do in this situation but keep calm and be observant. When we finally move it is about 7:25 and we make our way to the start line crossing it at 7:30, only 10 minutes in front of the broom wagon. It was some distance to the start line so if your marginal about making the then get an early number if you can don’t leave it to the last minute like I did and fret about the broom wagon. With the thought of the broomwagon only 10 minutes behind the pace was brisk at the start. There wern’t that many quick guys to go past so it was a case of grab a wheel see if it was good and keep moving forward. 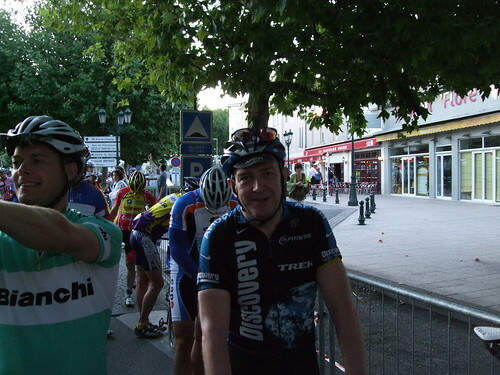 The intention is to tag all pictures with Etape 2009 and a rider number. I’d think you’d call it riding at threshold, I was having a good time, moving up with the pulse around 160 odd for the first hour. There was a fire cracker of a bang as someone had a puncture a few K in and you looked at some of what people where carrying and it was next to nothing. Hands up those who don’t carry any money? There are a few out there as I’ve met you. This question will come into play a lot later in the ride. 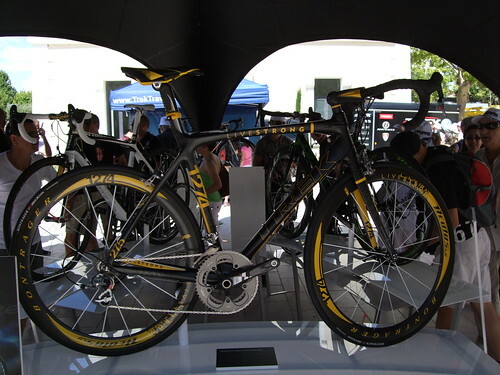 You only had to look at the Mavic assitance stands, overrun by top end bike owners wanting a tweak or fix for nothing. Hence the 27 mile ride to the start to sort things out, but I digress. This is the descent of the first Col which was marred by at least two accidents. It’s a straight road so it shouldn’t happen but it did and was an early wake up call. Accidents do happen and they hurt. On the run in to Bedoin I’m along side a guy that has dried blood on his face and only one arm on his glasses, True Grit comes to mind. Enough of the bad bits and back to the ride. By now I’m having the time of my life, drafting groups as no one wants to lead. At least at a pace that means the lead is doing all the work and the rest of the world is sucking his wheel. It proved fairly easy to draft, move up the group and jump from group to group and I don’t mean that in a boastfull manner. It’s the world bigest clubride with the captain having thrown a sickie. No one wants to lead as there is no coheasion in any of the ride. It’s 9500 individual riders looking after themselves. Comic readers should recognise the above kit if they read the thing. Recogised the kit and had a chat, turns out he had picked up a puncture and gave me a good tip about the next climb being harder than it looks on the profile with a few false summits. The first food stop was at Buis de Barronnies which looks a nice place. I wasn’t quite ready for what I saw and it’s 72 km into the event so you should have depleted some of your supplies. I had to some extent, bar a Torx bar that refused to open on the move, so that off the list. 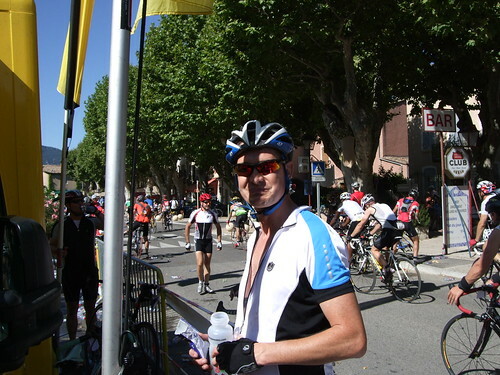 The descent of the Col d’ Ey was great and that leads to to the first food and drink stop, Buis le Baronnies. It’s still a bit of a bunfight if you hit the first tables but the thing that hits you are the thousand upon thousand of discarded plastic bottles on the ground. I’d wedged my bike behind the only free space, a Mavic assistance vehicle and got chatting to another 705 owner, filling bottles. You need to make the most of these events so it’s no great shakes to return favours taking pictures. The tables further down the line were a lot free-er and I had a piece of nice cake with nuts in it and picked up a few caffine gels. The old guy (older than me) jestured that this would give me power for the climbs. I was really touched by the helpfullness of everybody and it wasn’t just at this stop. A feature of this years event was throw away Waste Zones. It worked quite well in most instances except for one place that wasn’t but looked like it was. some poor chap got bombarded with all sorts of plastic. At one station I even saw a Camelback or a copy. 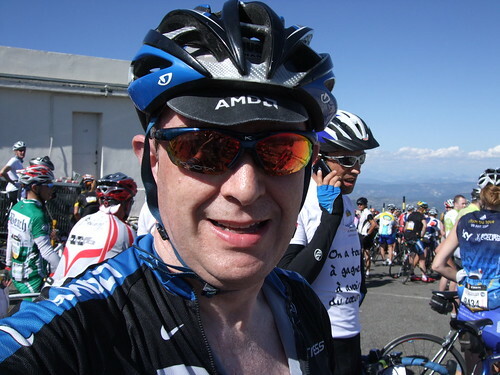 On one of the Cols I came alongside a chap from Audlem CC because of his top. We got chatting then came across a photo point. The are put in by the photographers to make you look good. The first one was seated and we’ll see how it turned out, the second was out the saddle as if we were climbing gods. I’m not the bravest of descenders but had a good go on stuff like this, the only guys that went past me where the guys on carbon deep section rims, like Mavic Cosmic Carbonne’s. It was all safely done with good warning signs at dangerous points. The chap above is French and a triathlete by the look of it as the double seat bottles are a Tri item. 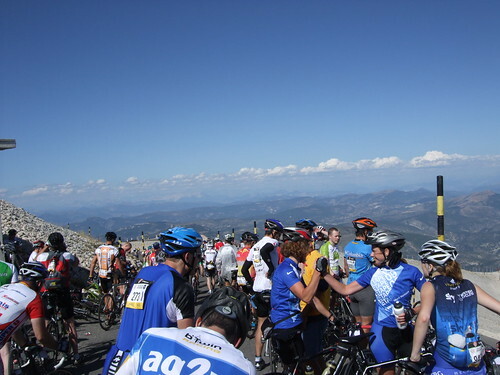 It’s great to take in the scenery and look back on how many riders you have passed. The first hour or so was all about checking numbers, are they coming down. Fortunately they were. It’s when you see low ones come by that you wonder what has gone on. 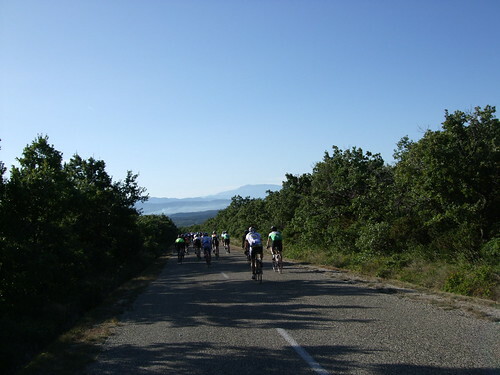 Throughout the ride we are taunted by our tormentor for the afternoon, the Ventoux. This is the view from the Sault side of things and part of the pain is that you loose a lot of height to get into Bedoin. 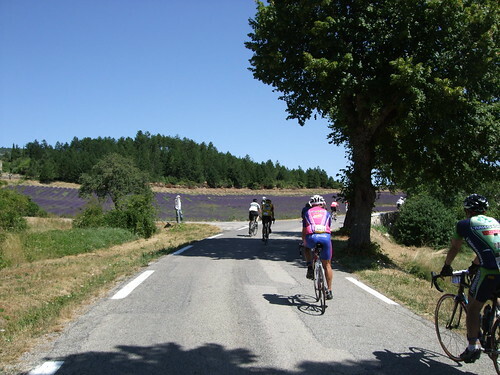 I just had to include a shot of the lavender fields that were dotted around the ride, you miss the first one but make sure you get the second. Somewhere around this point was the first elimination point(Sault) and water stop. I was expecting electronic timing but I’m told there was a clock and if you didn’t make it a barrier was put across the road. You won’t believe how good it felt to make the first one. It was a 10 km descent to it after being directed away from a village water stop by a local. It still didn’t stop people filling bottles and Sault was awash with them. This was the climb from Sault and it proved to be tough, there are unseen bits before it but this puts into perspective the warning I’d had about double false summits. What goes up must come down and its a very fast descent down towards Bedoin. A bit tricky with riders wanting to stick to the middle of the road but it was possible to gain a place or two once they knew you wern’t a Kamakaze pilot. The run in to Bedoin slightly down hill, notable for all the women riders getting cheered on by other women spectators. It was a bit of a madhouse in Bedoin, highly emotional have read Vals text wishing me well, having just made it there was another. I’m about an hour up on the broomwagon instead of ten minutes. There is a woman on the food stand that probably saved my ride, it’s as simple as that. I’d gone for more of the caffeine boost gels (brown in colour) when she saw what I was taking she said “Non” and pushed the blue coloured electrolyte gels my way. What I hadn’t realised was how dehydrated I was and this was going to repay me later. I thought I was OK but this was my first scorcher of a ride and I would pay for it. Heading out of Bedoin was another emotional moment with tears in my eyes thinking how far I have come to be here. Success was only 20 km away, the route looked familiar thanks to the Tacx trainer. I even managed a picture of the summit. What lay ahead tested many to the limit including me. 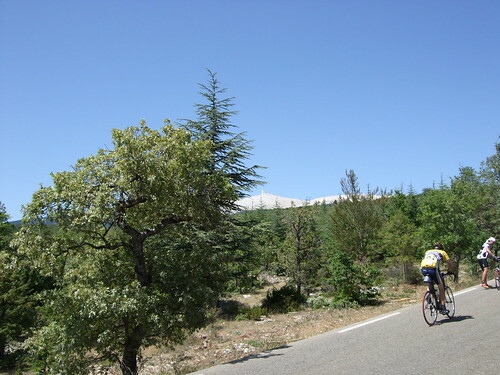 Bedoin to Ventoux: The Thirteen steps of the Cross. With 4-6 km of easy 4% and two water fountains in that distance you might be tempted to think you don’t need any water. 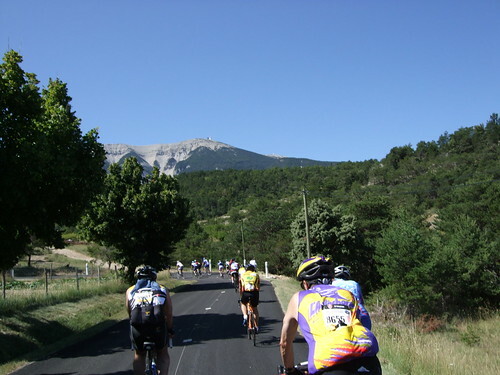 The above sums up what the Ventoux was like on the day, sheer hell. I stopped 13 times according to the Edge and walked on two sections. The above maybe the first or second time but my pulse was 175 BPM and I’m told it was 42 deg C in the trees. The sun is overhead so there is very little shade. Loads are walking, guys are laid out recovering under trees, some are throwing up. You have to see it with your own eyes and wonder if you are going to make it. The wooded section is unrelenting and rather than walk I tried to break the ride into 100m vertical climbs. This gave me time to recover so I didn’t totally blow up. Seemed to be working until an 11% section before I reached Chalet Reynard. Here I was struck by cramp of the legs which I have never suffered before. I know I’m in trouble now, take an electrolyte gel but there is nex to no water left. I opt to walk the 11% section as I am having trouble with 9% section. This happens twice, you need to realise that I know riding is better than walking and wouldn’t walk if I didn’t have to. After the Woodland section it thins out at the treeline to give you another look at your tormentor. Approaching the water stop things looked the usual mess as I pulled in behind another rider, only this time there is no water. Etape blown. We are directed over the way but my french is still at a level when I gave it up at 13. I saw no hosepipe that others used but did see a green water fountain. The problem was it was just a trikkle at best and there were 4 guys of whatever nationality trying to shove a bottle under it. It gets better one of them has to press the button to get the water. Queue, alien concept. Two minutes of this had me looking elswhere. Mistook the gas cylinder for a toilet block then went inside with the bottles and bought a beer. Good job I had change as a note was refused. Remember what I said about taking money on a ride? Then got told there was water in the toilets. Getting in there was a queue of 4 but it was soon sorted. Two bottles filled in seconds, down the rest of that beer and the dream was alive again. Back outside an orderly queue has formed, they must be desparate. I’m back in the race with about 6 km to go, peddaling at about 9-12 km/hr. Bump into another 705 owner , have a chat and get a decent picture of him which he wasn’t expecting. Looks like a titanium bike. The moonscape is really fierce and I’ve had another moment coming out of Chalet Reynard wondering whether I can actually complete this thing. This is probably the thirteenth stop, look back on what youv’e conqueured and look forward to what is ahead. My mind is going into overdrive wondering if I’m going to make the time limit now. It is touch and go but only if I stay on the bike. The KM countdowns are most welcome. There is a shrine and photo point at Tom Simpson place of death but it doesnt appeal. Surprisingly close to the summit ,not the 2 km they would have you think. A little after there is a 500M to go sign, the longest 500m of my life. Looking down at those still ascending the climb you are left wondering if they are going to make the finish time of 17:30, a lot didn’t. Over 2,000 didn’t. Shot is a bit sqew whiff but captures the view of the Sault side. I’m sure you could see the curvature of the earth up there. Descended like a demon with the Pro pictures to prove it. The next thing was to get to the finish 5 km down the mountain, this was to hand in the transponder pick up a finishers medal and in my case get back to the coach. Met up with the STI rep who pointed us in the right direction, also saw the “Doc” and Deano who had collapsed after the finish. Descent to Malocerne 21km down the mountain was fast but saw at least a dozen with puntures or blow outs due to heat in the rims as the surface was fine. Phoned Val up after I had got down to the village to let her know I was Ok and had finished the thing. Found the coach OK and then it was time to find out how others had done. One of our group got put in the ambulance 2 km from the summit and he was way ahead of the broomwagon. They wanted to send Deano to hospital but he was ok when fed. I’ve been informed by Eamonn ( a climbing god) that this ride was a 9.5 out of 10 and who am I to argue, it was really hard but over 7000 did finish. 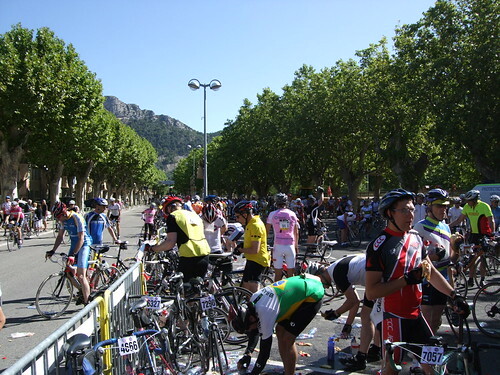 If you’re looking to do an Etape you either need to have exceptional organising skills or go as part of a group. The logistics are very complicated if you haven’t done one. An organised trip/ride is expensive but you do get support. Spare a thought for the Americans who pay about $5,000 for a ride like this, turn up on custom built bikes and have supplies dotted around the course. 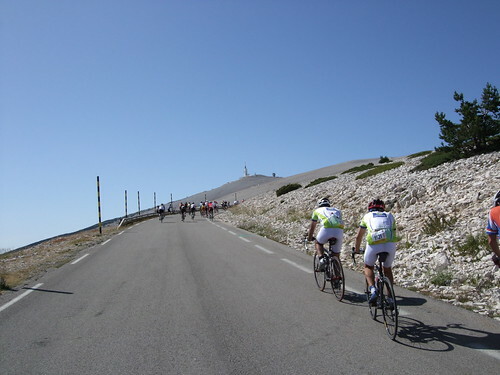 It matters nought when you are half way up the Ventoux confronting a few personal demons. 25 minutes stopped on 9 occassions in the woods. Walked 3 times @ 4 km/ hr, allways get back on the bike. 12 minutes at Chalet Reynard. 4 minutes after the Tom Simpson memorial which I remember stopping after but didn’t think it was that long. 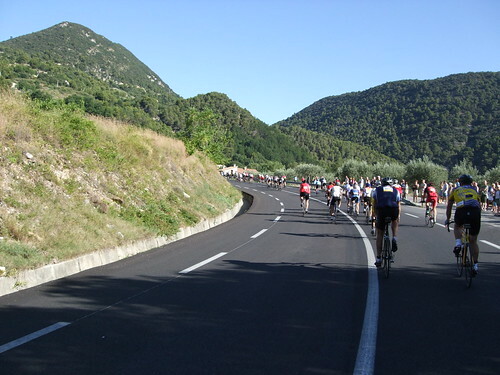 Monday:L’Etape du Tour. I can see why it has a cult status. The whole sportif scene has largely passed me by until now but to a whole class of people this is a lifestyle and they take it seriously. Very seriously. Felt like a black sheep for wanting a beer after being up for 20 hrs on the way down and nstill not getting one. Saving all the Etape stuff for the write up which may take some time. Tuesday:Etape rest day. 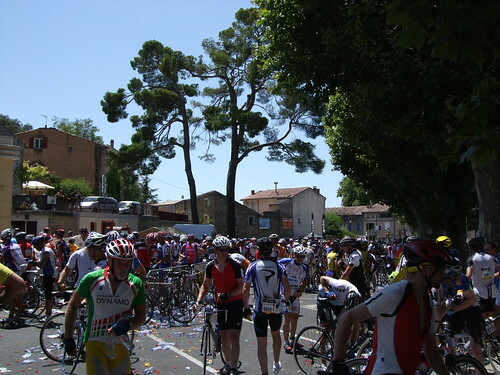 20 km ride out to a village and back then teamed up with the group to watch the Tour on Eurosport in a bar. Don’t feel too bad, others are hurting but it does seem all or nothing for them. The results are now posted so it is time to generate a results list for the 30 of us based on age categories. Flicker pictures to upload and started on the ride write up. Pictures are going to get tagged with rider numbers and I didn’t see anyone else doing what I was doing, certainly not on the moonscape. 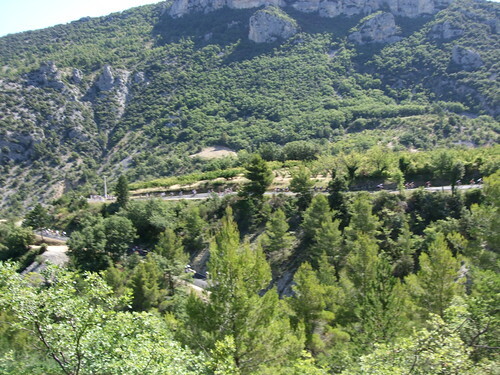 Wednesday: Ardeche gorge. 97 km , 1200 mtrs of climbing and some great sights to see. Better on a bike as it is more rewarding. Got baulked by a Johnsons coach on the way down. Decent lunch stop icluding a humongous pizza that wasn’t finished. I do have a picture. Group split on ability and water. I stopped at a village fountain on the way back as I was nearly out and it is very hot. Bar in town for the stage finish, hotel and shower for dinner. 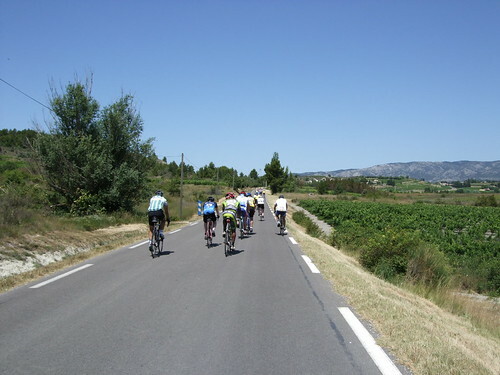 Thursday: A ride to Orange, a bit more laid back today, 63 km loop with a stop at the ampitheartre. More good food with more pictures. It is dear if your going from £ to Euro but is generally worth it. Food is great at the hotel too. Very hot on the way back with me going thru water at a great rate of knotts. We had great fun getting some Graham Watson ” Sunflower” shots. Harder than you would imagine, you can’t go into the sun, if the sun is at the wrong angle the sunflowers point the wrong way and it goes on. Graig dived into a field of them but it didn’t work. Plans are forming for the next 2 days. 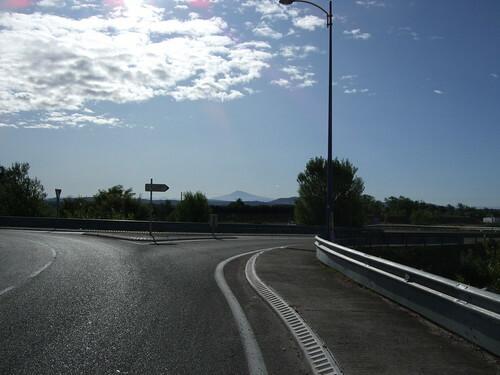 It isn’t straight forward, it may sound great to ride to a stage but the reality can be a bit different. 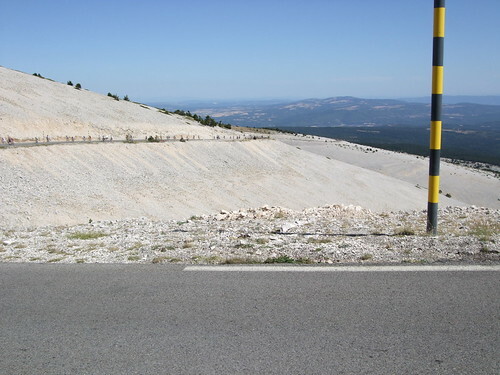 The Ventoux is the worst possible case. Too many people, a narrow road. a bike is going to get swamped. Above Chalet Reynard, dream on. 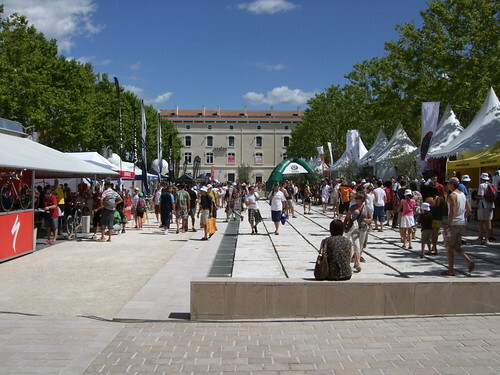 Friday: Coach trip to Aubenas to watch stage. Site has been down a while, plenty of time to catch up. Cav does the business and I was there@ 350 m mark. Monday: Spinning class then the gym. Weights and a few cardio machines. Exercise bike at level 25 is just under 300 watts. Cadence is about 50 rpm which is what is was when I was going up the Shoe later. Drove to the Ponderosa with the shoes this time and went down the Old Shoe and up the Shoe twice in 50+ minutes. The idea was to get some climbing in look at the gradient and the speed. 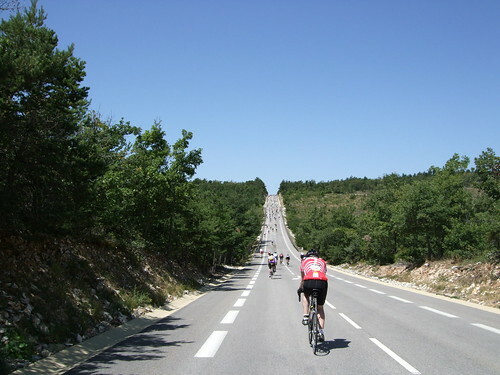 On the Ventoux next week if I make it I’m looking at just over 6 mph. So the 2 hours on the Tacx is real enough. On the second climb the sweat is pouring out of me, running down the peak of the cap and all over the Edge. 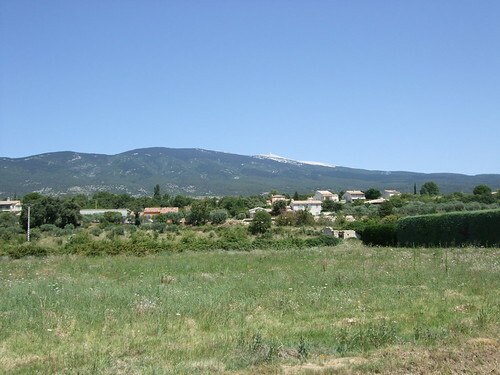 39×27 is doable at 8% for the Ventoux but 13 miles is iffy. Good job I’ve the buzzsaw (26) to fall back on if I blow up. Tuesday: Brimstage 7 in the evening, probably the gym in the morning. Nothing daft now as I’m not looking at picking up an injury. Hill repeats up Grange Road after the gym as I was bored. 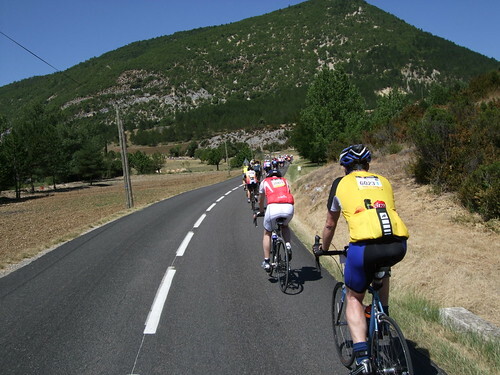 Gradient is around 7% but it’s hardly the Ventoux. Did 9 reapeats which is a couple of miles of climbing and 1045ft. Bought a map of the area from Goulds. Brimstage 7, which was the last one in the series. Took the tri bars off the other day and it showed. 9min 16 seconds this week. I did welcome the ability to shift gear on the drops this week. Got soaked on the ride home. Wednesday: Bought some decent tyres, conti Attack and Force. Fitted some new bar tape and brake pads after giving the bike another clean. Sorted the bike bag out, no seat and no bars to make the size restrictions. 20 miles on the bike but all of it flat. Thursday: Winding down now, Gym for half an hour then a spinning class. New cleats on the shoes and a dress rehersal for what I’m going to take on the ride. Some last minute shopping and thats me done. Final results for the Northend Time Trial League results are out, finished third in the B league behind the two girls, Vicky and Janet. Last minute flap, punctured a tube putting the tyre on. Friday: 5 am start from Manchester. Going to be a long day. Arrived in Paris at 10.30pm, no evening meal, bike bag spent the night in the room because of possible bike thefts. Saturday: Travel down to Montpelimar. Another long day on the coach with traffic delays due to a caravan accident and a motorcycle crash. Hotel seems fine and the food is good. Been out of the loop tour wise for 2 days now. 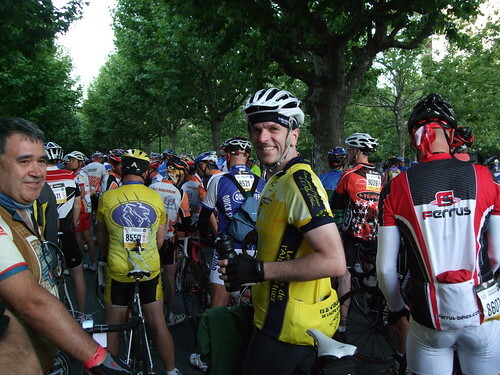 Sunday: Rode 27 miles to Registration at the Etape Village. Our group of 20 split and split again and I ended up signing on on my own and the finding the others when they had booked their bikes in to the overnight bike storage. This was later abandoned in favour of returning to the Hotel with the bikes in the trailer and taking them to the start. If we get caught in a jam, just unload the trailer and ride to the start. Weather was scorching and is going to be a problem on the day. Another good meal at the Hotel. There is a lot to catch up on but it’s time to sort things out for the big day.Rise at 4 am, breakfast 4.30, start 7.00 am finish whenever. Monday: Etape update: Finished around 17:12 so inside the time limit, didn’t get over the line until 7:30 so I was up against it all day. 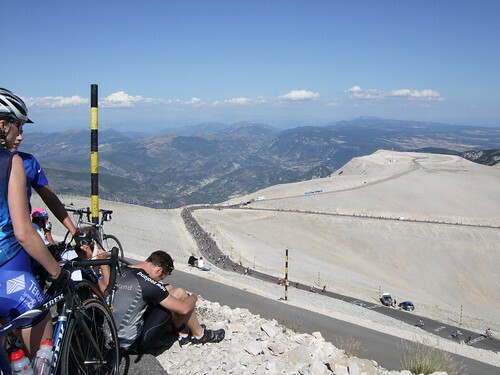 The Ventoux is just out of this world as a climb, it’s hard to comprehend how tough it was after 150 km. Big write up coming up along with the usual pictures. 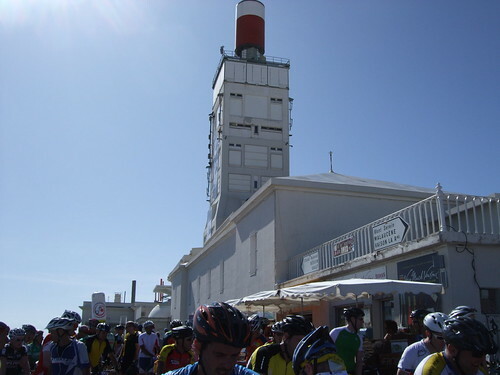 3:20:56 to get up the Ventoux. There is a tale to tell there. Monday:Spinning class and the gym at West Kirby. Had 1/2 an hour on a exercise bike to see what wattage I’m comfortable with. Took the front wheel to Colin to get it trued as a spoke is continually loosening off. Gave the bike a good dose of looking at and found the bottom bracket shot so it was off to Deeside for another. Watched the Tour then got a refund on the fan. Tuesday: Late morning spinning class. Fitted bottom bracket only to find I’d put a lip seal washer on the wrong way around so it was my fault it was shot. Found the chain was shot as well, so I,m litterally wearing the bike out. 2.5 hrs on the Tacx with The Giant of Provence while watching the Team Time Trial. This is one of the best starts to a Tour for ages. Northend 10 time trial from Pulford. A strong sidewind has me loosing a minute and half on the last one. 26.38 minutes this week. Dropped to 5th in the league with the scratch riders getting 6 rides in. Can’t complain really having mucked around on the trainer for over 2 hours. What I did notice on the DVD was the lack of places to get water, the available ones are going to be programmed into the Garmin. Wednesday: A damp start had me staying in. Lunch at the Eureka and then off to see Keith at Eureka Sports who is doing his Ironman this weekend in Switzerland. Price of bike bits has shot up, £37 for a chain these days. Fitted chain using a split link only to find most of them were 8 speed so that needs sorting. The shimano pins are a right pain. Had a look at the bottom bracket again as I noticed a creak. Next up is a new pair of Look Keo’s. They still function OK but are a bit sloppy. Thursday: Spinning class and a session in the gym, mainly weight machines this time. Picked up the comic on the way home along with fruit. Been checking out climbs on WWW.Climbbybike.com . The split link wasn’t agreeing with the front mech on a test ride. Found adjuster seized so fitted a new cable adjusted the stops on the mech and that improved things. Friday: Time to get a ride in. Drove to the Horseshoe pass only to find I’d left my shoes at home. Tea at the Ponderosa and a slow drive home. 28 miles around Wirral after watching the Tour. Saturday: Was going to be a ride day, but it’s time to start getting sorted for the Etape. Manchester to sort out drop off for Friday. Saw all the direction signs for the Manchester to Blackpool charity ride. Sunday: Marshall duty for the Open 25. Missed the 10 oclock ride from the Eureka so went out with Barry and Vickey to the renovated ICF. One hour twenty two for the outbound 25 miles meant the pace was high. Just what I needed. 43.3 miles at 17.6 mph. The Ice Cream Farm looks realy good now, cycle racks where the hedge was and no one trying to nab a disabled space 10 ft from the door. Incident on the way back with Vickey touching my wheel and ending up on the deck. A lad on a mountain bike confused things coming across our turn in in point. Thankfully no damage, got put on the front so it wouldn’t happen again. Led Barry out for two signposts and enjoyed the sun at the Eureka again. Meanwhile Keith is doing his Ironman in Switzerland in the rain. Things are hotting up in the Time trial league with me going backwards having done my best rides. I’ve gained points by doing poorly attended rides in bad weather, if 10 turn up and you finish 10th you still get 15 points.